In daily life it is normal to hold liable a person who causes you damage. Yet some insurers forgo this recourse all too easily. Opportunities for subrogation exist even in seemingly hopeless cases such as natural catastrophes, provided the proper provisions have been made. If an insurer has covered a loss, it has a right of recourse against responsible third parties. The purpose of this rule is to avoid the injured party being compensated twice for the loss (by both the insurer and the party that caused the damage). In addition, it prevents the at-fault party from benefiting from the fact that the injured party has insurance that covers the loss. Subrogation thus ensures that the indemnity insurer does not unwittingly also become a liability insurer for the party responsible for the damage. The fact that subrogation is a ubiquitous issue, appearing even in the most unlikely of contexts, is exemplified by the California wildfires that caused over US$ 1.5bn in damage in San Diego in 2007. Whereas some insurers assumed that the long drought leading up to the fires had been exclusively to blame, others retained counsel to investigate possible avenues of recourse. The investigation found that the fires had not in fact been pure acts of God but were caused, among other things, by sparks from poorly maintained power lines. With the aid of legal counsel, significant amounts were recovered by subrogation. Another case revolved around water damage to a school in Arizona caused by a flash flood. During an investigation, it was determined that the school had been built on a site onto which surface water was channelled after heavy rainfall. A diversion gully had been built for this reason, but it was evidently not big enough to contain such large volumes of water. The case went to court, and the contractor responsible was held liable for 90% of the loss. These two examples show that subrogation issues should even be considered in the area of nat cat damage. The benefits of subrogation are more evident for man-made losses but, even here, insurers face certain pitfalls. Firstly, the question of the at-fault party should be investigated as a matter of routine. If this party can be established, the next step is to examine whether culpable conduct can be proven and consider the chances of actually recovering the loss. It may involve a sole trader – or a multinational conglomerate with revenues in the billions. Sometimes several parties are involved and are jointly and severally liable. This avoids the risk of winding up in hopeless legal battles that last for years and entail fees that are out of all proportion to the subrogated claims. This is an especially great risk given that the party responsible need not necessarily disclose if and to what extent it has liability insurance or sufficient other financial means. Even if it is clear that the injuring party has sufficient insurance cover or financial strength, it may not always be beneficial to pursue the recourse. This is the case if a multi-line insurer offers property and third-party liability (TPL) covers and both lines are affected by the same insured event, but for different policyholders. This situation could potentially lead to a conflict of interest. For example, if the injuring party’s liability policy provides significantly more cover than the share of the claim to be paid by the insurer, subrogating the claim would be disadvantageous. This simple arithmetic approach becomes problematic, however, if the insurer is part of a market in which the other insurers are not faced with the same dilemma. The lead carrier is required to (co)represent the interests of the entire market and thus subrogate even when this would be against its own interests. It is thus better not to let such situations come into being in the first place. All insurers must take the relevant compliance measures to create ethical walls to ensure that information about indemnity limits in the property and TPL lines remain confidential below a certain management level. If doubts arise on the market about whether a company handles such conflicts of interest in an ethical manner, its participation in future insurance programmes is sure to be affected. Demonstrating transparency vis-à-vis one’s co-insurers is therefore recommended in such situations, as is the appropriate resolution of the conflict of interest. Such conflicts can be resolved, for example, by the insurer’s taking a more observational role within the panel. But unilaterally waiving all recourse is not the answer in many cases. Indeed, the insurer will often even harm itself if it does not subrogate, since the co-insurers who are not in conflict will certainly want to take recourse and, if successful, will pocket the reluctant company’s share for themselves. Interests of another kind can conflict if the at-fault party is closely associated with the policyholder. This party might be a subsidiary or an official agency that the policyholder depends on for certain permits. Or it might be a key supplier, which then revokes the policyholder’s status as a prime client, thus jeopardising the policyholder’s supply chain. Since subrogation is optional, it can be contractually waived at any time. Indeed, insurance policies often contain a partial exclusion of recourse. These exclusions are accepted by insurers because, as partners in risk, they are not blind to their customers’ business interests. However, waivers of subrogation require that the scope of eligible parties be clearly defined in the exclusion clause. Universal waivers and clauses conditioned exclusively on the policyholder’s consent are not recommended. Yet even in such cases, opportunities for recourse are not completely lost, provided the policyholder still has an own interest in holding the perpetrator responsible. This may be the case if the relationship with a supplier is ruined or the policyholder would be putting its reputation at risk if it continued to work with the supplier. Other situations are also conceivable, such as if the policyholder has to pay a high deductible or the loss exceeds the acceptance limit. In such cases, the insurer and policyholder can agree to drop the exclusion of subrogation at any time. Ideally, the parties would do this with the help of a specialist law firm which they have chosen together, and in the context of a subrogation agreement in which they set out their binding rights and obligations and all other important aspects of their common objective. This includes the sharing of litigation costs and a precise description of how any recovered proceeds are to be distributed. Stock phrases such as “pro rata” or “proportionally” are often not specific enough in this regard, since the basis for performing this proportional distribution needs to be clear. This is particularly relevant where there is a high level of uncovered damage, either due to deductibles, acceptance limits being exceeded, or losses not being insured at all. Indeed, the greater the amount of such damage, the lower the insurer’s share of the gross total loss and, accordingly, the lower its share if the recourse is successful. 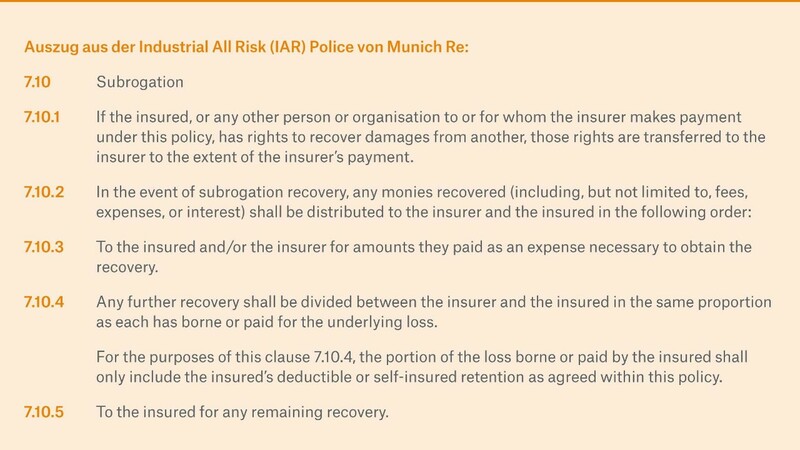 Wording such as that found in the model clause of Munich Re’s Industrial All Risks Policy can provide the necessary clarity, even in the context of an agreement made after the loss has occurred. In addition, the contract needs to stipulate in whose name a potential suit against the injuring party would be filed and who would take the final decisions in settlement negotiations – whether in or out of court. One can also stipulate that policyholders cede all their recourse rights. This means that they will not appear as parties and their names will not be included in the proceedings. If the parties can agree on these key points early on, they can create a greater sense of trust and cooperation and avoid potential conflicts further along in the proceedings. The insurer and policyholder can thus also work more purposefully towards developing a common strategy to prevail against the injuring party. After all, proving guilt is not often easy – it takes time and resources. In certain lines of business in which subrogation issues often arise, such as motor or health insurance, insurers will typically have a department or a number of specially-trained staff whose job it is to routinely investigate recourse options. However, in property and especially industrial insurance, such systematic investigation is not yet standard. Insurers who baulk at the high costs and effort involved in subrogation, despite the great potential, should consider the possibility of cooperating with an external law firm. This works best on the basis of a framework agreement with a specialist subrogation firm which would review possible claims against third parties as early as possible – ideally as soon as the loss is reported. If this review is delayed until the later stages of the overall claims process, the chances of proving culpability are typically much smaller. It is better to secure evidence early on, using photographs or expert opinions, and to interview witnesses before their memories fade. Framework agreements should stipulate the parties’ rights and obligations, and how costs and proceeds are to be divided. They also include the key processes, thus enabling the tasks outsourced to the lawyers to be integrated as seamlessly as possible into the insurer’s claims procedure. The agreement should also set out, at key junctures, who must inform whom about what, when, and in what form, and stipulate the loss amounts beyond which the law firm’s assistance will be called upon. If the parties can agree on fees that depend on the amount of indemnification (contingency fees), the financial risk to the insurer is kept to a minimum. If performance-related fees are legally not an option – which is the case in much of Europe – the insurer can provide the firm with a set budget per case to initially assess possible avenues of subrogation. Further steps would then be considered only where there were realistic chances of recovery. It is clear that insurers who are aware of these issues and who have set up structures to deal with them increase their chances of recovering damages. It certainly does not make good business sense for an insurer to flatly reject all claims it assumes have little prospect of success. Smaller insurers in particular quickly reach the limits of their capacity in this regard. Specialist firms and reinsurers such as Munich Re can provide valuable services thanks to their vast experience. They have built up the necessary networks and have the long-term stability required to weather disputes that could go on for years. Munich Re has drawn up a best-practice clause in its Industrial All Risks Policy that aims to equitably reconcile the various interests in subrogation proceedings. The clause addresses two decisive questions: firstly, who are the main stakeholders and, secondly, how are the costs divided? It stipulates that the insurer will initially advance the costs of the litigation. If the suit is successful, these advance payments are then reimbursed before the sum paid by the injuring party is split on the basis of a considered and clearly defined system: a win-win situation that creates value for both sides. In conclusion, anyone who still has doubts about whether it pays to thoroughly consider subrogation might reflect on a final, simple piece of arithmetic: successful subrogation always constitutes a risk-free net gain. In somewhat simplified terms, this means that successfully recovering €100,000 through subrogation is equivalent to writing a premium (given a 95% combined ratio) of €9.5m.